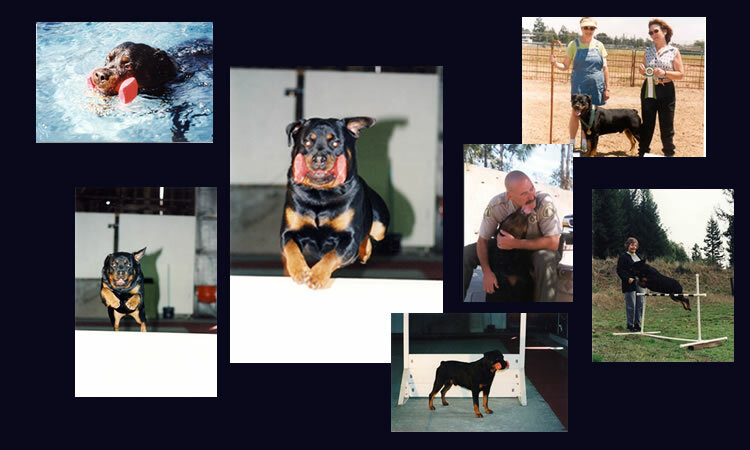 When I set about to have a companion dog and settled on Rottweilers, my goal was to have a dog I could train to be obedient, was healthy and protective. Rusty's breeder, Elizabeth Fivian Stein, DVM, didn't make distinction between show and pet quality, but is an approach that I have come to appreciate as both take the same amount of time and effort. The decision whether I chose to show my dog was wholly my decision. Rusty took me places I didn't even dream. 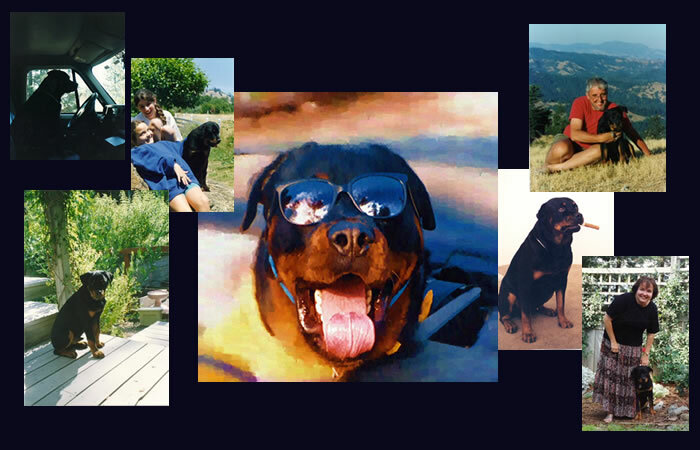 An outgoing, well-adjusted male, he turned out to be my once-in-a-lifetime dog. I quickly became interested in competititve conformation and obedience. Much of what I learned came in bits and pieces and from Rusty himself. He turned out to be a beautifully athletic specials dog, ranking in the Top 10 as a Limited Special with an all-breed handler, going to #3 in ARC rankings at one point. He went on to attain an advanced obedience title which was, as far as I am concerned, one of his finest achievements. He could do it all when given the chance. We garnered two herding legs and then when he developed a neck injury, we started swimming as part of his therapy after which he came back at age nine to win two BOB in Palm Springs. His daughter, Misty, won BOW at the Nationals 2000 at the same show Rusty took a Select 1 Award with a stand-in handler. He attained a Silver Sire award based on only nine stud services, twice to the same breeder, who stated he improved the toplines in her breeding program. His pedigree is filled with both conformation and working titles. An International Judge wrote: Very outgoing, confident, noble dog: an excellent representative of the breed. Well conditioned with strength and substance; excellent quality double coat, correct markings; well-proportioned head; scissors bite with full dentition; eyes well set with correct shape and expression; ear set and carriage good; well developed chest with good rib spring; moderate layback of shoulder with good front angulation; very good back angulation with strong hock; strong, level, broad topline; tail is to standard; moves with excellent reach and drive. These are his show pictures: Blue Grass Classic | ARC National 2000 | As a Special | Additional Photos. Watch this youTube video clip of the 1998 Oregon Cluster competition. For further information, contact Nancie Guido.